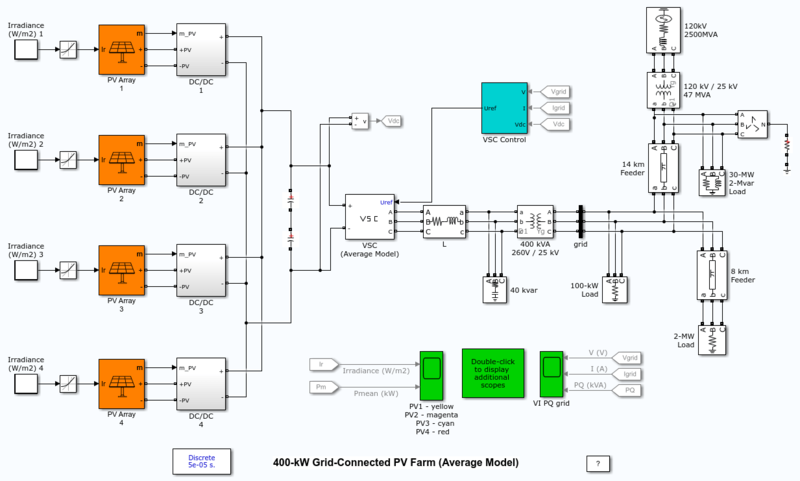 This example shows an average model of a small PV farm (400 kW) connected to a 25-kV grid using two-stage converter. The PV farm consists of four PV arrays delivering each a maximum of 100 kW at 1000 W/m2 sun irradiance. A single PV array block consist of 64 parallel strings where each string has 5 SunPower SPR-315E modules connected in series. Each PV array is connected to a DC/DC converter (average model). The outputs of the boost converters are connected to a common DC bus of 500 V. Each boost is controlled by individual Maximum Power Point Trackers (MPPT). The MPPTs use the "Perturb and Observe" technique to vary the voltage across the terminals of the PV array in order get the maximum possible power. 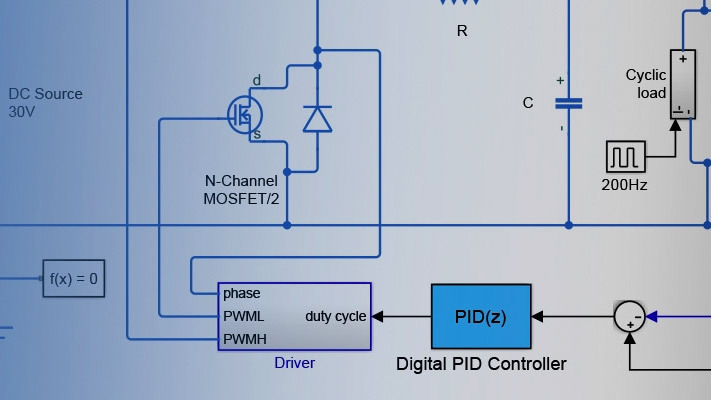 A three-phase Voltage Source Converter (VSC) converts the 500 V DC to 260 V AC and keeps unity power factor. A 400-kVA 260V/25kV three-phase coupling transformer is used to connect the converter to the grid. The grid model consists of typical 25-kV distribution feeders and 120-kV equivalent transmission system. In the average model the boost and VSC converters are represented by equivalent voltage sources generating the AC voltage averaged over one cycle of the switching frequency. Such a model does not represent harmonics, but the dynamics resulting from control system and power system interaction is preserved. This model allows using much larger time steps (50 us), resulting in a much faster simulation. Note that in the average model the four PV-array models contain an algebraic loop. Algebraic loops are required to get an iterative and accurate solution of the PV models when large sample times are used. These algebraic loops are easily solved by Simulink®. Start the simulation and see the resulting signals on the various scopes. This three-second simulation allows us to observe the operation of each individual PV Array system under varying irradiances.